There are plenty of plot points that Yates either faintly touches on or omits completely. That said, if there’s anything in the film that leaves you scratching your head, don’t worry: within ten seconds you’ll be on to the next great adventure. The film opens in the same way as the novel. Harry, on the other hand, has set out with his best friends Ron Weasley (Rupert Grint) and Hermione Granger (Emma Watson) in order to find and destroy seven horcruxes, which each house a part of Voldemort’s soul. Only when the horcruxes are destroyed may The Boy Who Lived be able to bring an end to the reign of Lord Voldemort. The trio travels through forests, cities and government buildings and the script follows the novel’s narrative nearly to a tee. As I stated before, Yates takes liberty with a few plot points and, I must say, he makes some good calls. I was particularly satisfied with the aerial battle over Surrey near the beginning of the film. However, this is also where the film falls a bit short. A few key items from the book are introduced but never explained. Some of the minor characters are also briefly mentioned but their existence will never fully be understood by casual audiences. Just as Yates merged the roles of Ludo Bagman and Barty Crouch Sr. in the fourth film, he may have done well to try the same with a few characters in Deathly Hallows. One of the things I admire most about the film franchise is that it’s maintained an unprecedented level of consistency with its cast. 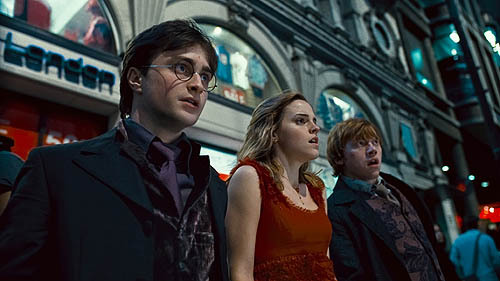 The three title roles of Harry, Hermione and Ron have remained unchanged over the last decade and so has nearly every other major character from each film. Of course, the exception here is the substitution of Michael Gambon as Dumbledore over the late Richard Harris. Seeing Radcliffe, Watson and Grint mature onscreen in nearly the same timetable as their fictional counterparts gives a certain weight to the film. They’ve grown close both on and off stage and it shows. The relationship between Harry and Hermione, especially, is explored to great effect. Those who have read the book know how it all ends, but die-hard Potter fans will be enthralled with the way Harry and Hermione’s friendship is depicted in this film, even if it’s a bit different from Rowling’s narrative. Most of the changes Yates makes are done in the name of good story-telling. And that’s where Deathly Hallows truly shines. For all of its omissions and minor flaws, it’s a joy to watch, and it’s definitely recommended for fans of fantasy and adventure films. I just have a couple of words of caution. Just as Half-Blood Prince and Order of the Phoenix before it, Deathly Hallows is not for younger audiences. The characters have grown up, and while the world itself is still as mysterious and awe-inspiring as before, it’s full of danger and darkness this time around. And if you’re new to the franchise altogether, this isn’t the place to start. Read up on Harry Potter history or watch the previous two films. That should prepare you well for what is Yates’ best Potter film yet. After this, I have high hopes for Deathly Hallows Part 2.